New free agent acquisition Trey Burton was featured early on in the short and intermediate passing game. He showed good chemistry with quarterback Mitchell Trubisky and ended up scoring a wide open touchdown on the first play of the second quarter. Chase Daniel orchestrated the second string offense well, leading the Bears on two late touchdown drives by taking what the defense gave him and hitting Taquan Mizzell frequently out of the backfield. Daniel’s best throw of the game came in the first half, finding wide receiver Marlon Brown with a well-placed ball on the sideline. The Broncos offensive line had trouble stopping Kasim Edebali off the edge. Edebali showed good burst and consistently beat the offensive line at the snap. His speed was on display when he cleanly bent around guard Eddie Turner to record a fourth quarter sack. While cornerback Kevin Toliver had a pass breakup, he struggled mightily throughout the game. Broncos’ quarterbacks targeted him often, and for good reason, as Toliver was torched multiple times for big plays, including the Broncos’ lone passing touchdown. Quarterback Chad Kelly played really well with the second-team offense on Saturday night. Kelly made a few good throws, including finding the hole in the zone and hitting Cortland Sutton on a seam route. While it may not show in the box score, Royce Freeman was the Broncos’ best running back tonight. He demonstrated his power on some punishing runs, shrugging off would-be tacklers. Denver’s front seven did a good job of containing the Bears run game all night. Chicago’s running backs were met in the backfield on multiple occasions, including an unblocked first-quarter tackle by Brandon Marshall that went for a loss of four yards and pinned the Bears at their own one-yard line. Rookie cornerback Isaac Yiadom had a rough night in coverage, allowing a handful of receptions and getting hit with multiple costly penalties. He also got beat badly off the line of scrimmage late in the fourth quarter on a fade route for what would have been an easy touchdown had Daniel not overthrown it. 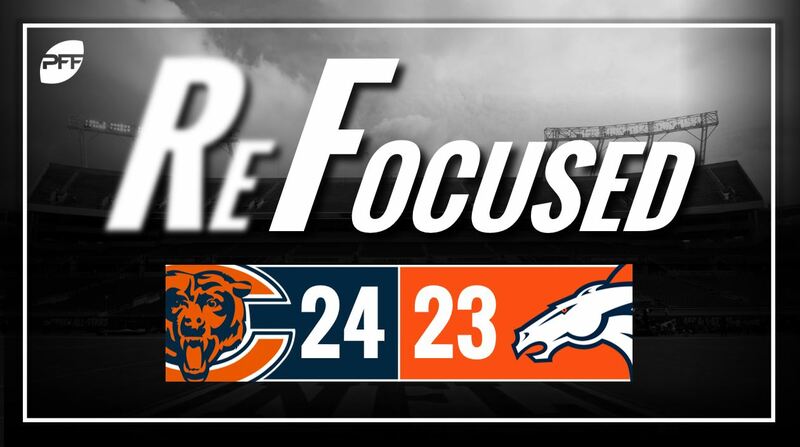 Chicago: There weren’t many big, flashy plays in the two late drives orchestrated by the Bears offense under Daniel, but they were able to keep the chains moving by taking the underneath routes that the Broncos were giving them and converting in the red zone. That was good enough to get them the win. Denver: Quarterback Paxton Lynch was inaccurate and sensed ghost pressure constantly. Lynch would hold onto the ball for long periods of time and would frequently deliver the ball late. His performance undid the good play of Kelly and Keenum earlier in the game.